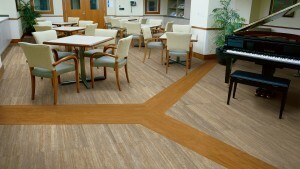 Armstrong LVT features high-performing and durable products with realistic visuals and textures. You can create a timeless look of natural stone or tile look, or you can create a rustic or traditional look of hardwood. The luxury vinyl tile from Armstrong comes in traditional LVT flooring, enhanced LVT flooring, and rigid core LVT flooring. 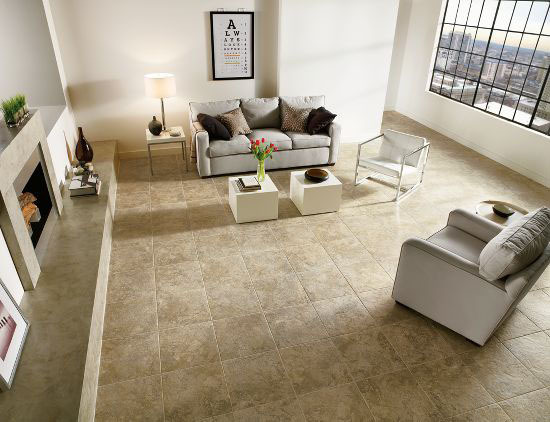 You can find the perfect type of luxury vinyl tile for your home. 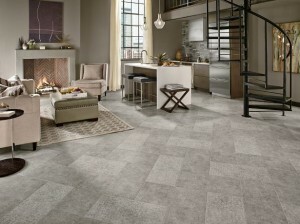 In addition, the Vivero luxury vinyl tile collection from Armstrong has the company’s new Diamond 10 Technology. The Diamond 10 Technology finish makes the flooring waterproof and resistant to scratches, stains, and scuffs. 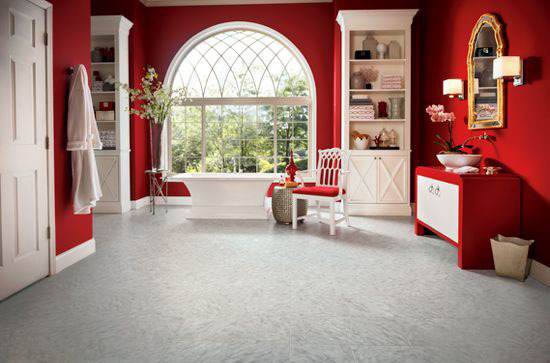 Be sure to check out the luxury vinyl tile flooring options from Armstrong. Recently, Armstrong announced that they have introduced five new additions to the company’s Alterna engineered stone flooring collection. The Alterna collection is inspired by today’s most exciting, contemporary looks, and these luxury vinyl tiles are perfect for mixing and matching. 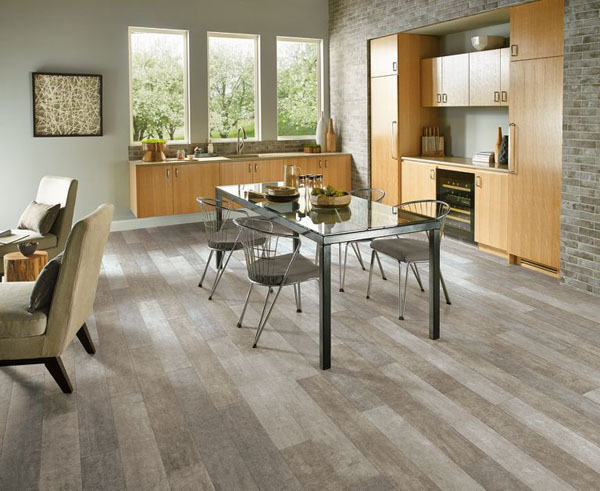 You create a gorgeous custom flooring in your home with all the beautiful options from the Alterna collection. 1. Whispered Essence & Regency Essence: This is a concrete-infused collection that blends soft gray tones with shimmering iridescent motifs. Each design compliments each other beautifully creating an elegant look with a decidedly global edge. 2. Enchanted Forest: This collection was inspired by the bewitching beauty of wood. The intricate texture of timber is casted in stone to create a structured concrete look that is infused with a delicate wood grain. 3. Rossini Marble: The graceful veining found in marble features cool gray tones, which are underscored with a hint of warm beige to create a classic look that is timeless. 4. Urban Gallery: This collection was inspired by recent linen trends in ceramic and porcelain. This sleek contemporary design mimics the linear texture of the filament strands to create a striated tile that is reminiscent of an organic fabric. 5. Artisan Forge: This collection has a rustic look of metal that has been weathered by time and the elements. There are many different ways you can use the Alterna collections to create a gorgeous floor. You can install the square tiles in a diamond pattern. You can use rectangular tiles to create a herringbone design. You could also mix sizes and shapes to create windmills and borders. In addition, besides all the great patterns and shapes you can create, you can also mix and match many of the unique colors in the collections. Alterna from Armstrong offers high performance, affordable price points, strong aesthetics, and the products are made in America. The products are designed and printed in Pennsylvania, and the stone is quarried and manufactured in Illinois and features more than 90 perfect domestic content. 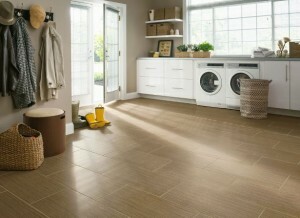 Alterna luxury vinyl tile is great for kitchens, bathrooms, basements, laundry rooms, and other high-moisture areas. This flooring can be installed over minor subfloor irregularities without the risk of cracking. It also installs in less time than most ceramic tiles. 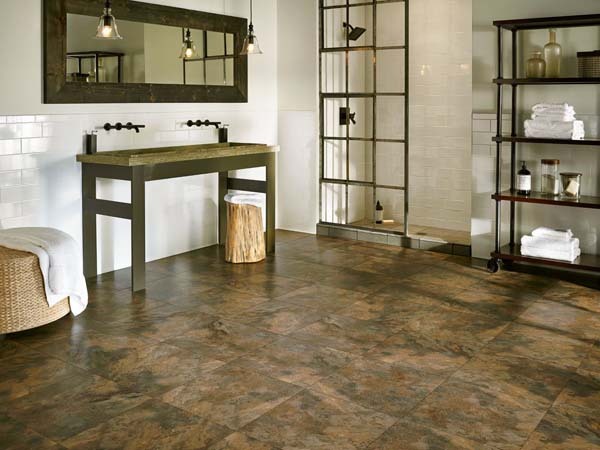 Click here to see our collection of Alterna luxury vinyl tile from Armstrong. Armstrong Commercial Flooring announced that its recycling program has expanded to include the company’s luxury vinyl tile. The recycling program for vinyl composition tile has already recovered more than 6 million pounds of post-consumer VCT since 2012, and now the company will help the environment even more by recycling LVT. 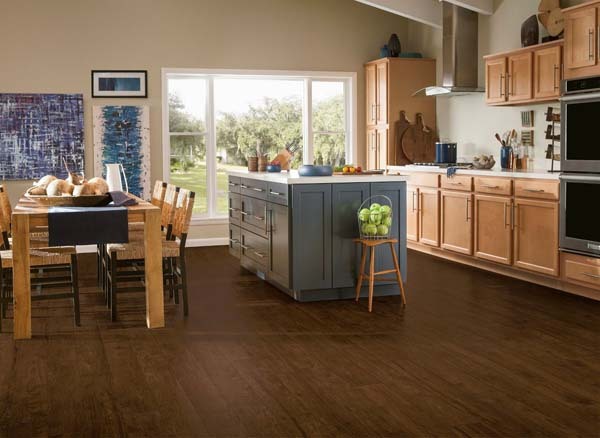 Armstrong luxury vinyl tile and qualifying competitors’ LVT products will be recycled into new flooring products at the company’s Stillwater, Oklahoma and Lancaster, Pennsylvania manufacturing facilities. Armstrong recycling program now has a simplified four-step process and no job size limits, which make it easier for customers to return flooring products and install new products during renovations. Building owners, facility managers, and contractors are able to save money on waste disposal, conserve natural resources, and obtain Leadership in Environmental Energy and Design (LEED) credits for diverting waste materials from the job site. 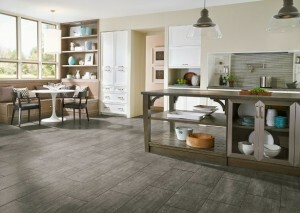 Click here to see our Armstrong luxury vinyl tile. The Natural Creations luxury vinyl tile with the I-Set Installation System from Armstrong Commercial Flooring was named a 2014 Best of Year Honoree by Interior Design Magazine in the Healthcare Flooring category. This award recognizes superior interior design products and projects. In addition, Natural Creations was designed for quick renovations and fast track construction projects. Click here to see our collection of Armstrong LVT. On April 11, 2014, Armstrong began expanding the luxury vinyl tile (LVT) plant in Lancaster, Pennsylvania. This project was announced last October, but the expansion has just now started. Shipping of the luxury vinyl tile starts in the middle of 2015. In addition, Cushionstep, Armstrong’s fiberglass-backed residential sheet product, is getting a new production line. This new production line will be inside a vacant 30,000 square-foot section of Armstrong’s Dillerville Road Complex in Lancaster, PA. Overall, the plant expansion will cost $41 million. 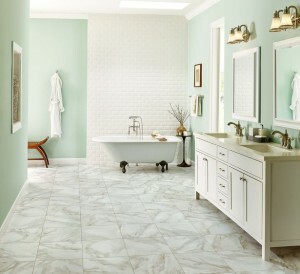 Click here to see our collection of Armstrong luxury vinyl tile. Click here to see our collection of Armstrong Cushionstep vinyl.